I am slowly getting used to filming myself as I paint watercolours! Yes, I have ambitions to vlog on YouTube, a little about me and a lot about painting watercolour. There are a few barriers to navigate, one is filming myself, that feels so weird and the other obstacle is the amount of new stuff I have to learn like video editing and how to use a Go Pro. I’m getting there, I had hoped to be on YouTube already but one has to learn to walk before one can run as they say. “Coming soon!”, I can also say that. Sunday was a rainy day here in Stockholm so I stayed in my studio and played with my GoPro camera. 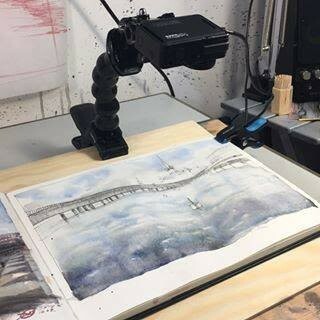 I filmed myself painting a sketch in my Moleskin journal. I have an ambition to publish films of my painting process to help others learn from the knowledge that I have gained since I started in 2012. I need to learn how to edit film, next weeks project I guess.